FSCJ had its grand opening of the H.O.P.E. FSCJ Food Pantry on April 13 at FSCJ’s South Campus. Students can come in every day the pantry is open and can “grocery shop” for up to 5 pounds of food, but weight can be increased depending on individual need. The newest addition to the pantry’s newly student voted name, “H.O.P.E.” stands for “Helping Out People Every Day” reflects its mission of eliminating the daily stress many college students face regarding food. Currently, the pantry at the South Campus is a pilot and based on its success will determine whether pantries spread to other FSCJ campuses. Since its grand opening, the number of students that visit has tripled and students at other campus have already voiced a need. Many students from Downtown Campus have already been expressing their need for a pantry to Student Volunteer Coordinator (SVC), Kayla Smith. Donations can be dropped off at all FSCJ campuses in their collection bins. These bins can be found at the Welcome Center, Student Life and Leadership, the Security Office, The President’s office, and the FSCJ Food Pantry at South Campus. The food is then weighed by the pantry’s staff and inventoried into an app called “Pantry Check”. This ensures that expired foods are taken off the shelves. However, many foods have a shelf life longer than what’s on the label. These foods are still available to students and are kept on a separate shelf and that weight is not counted towards the daily 5-pound limit. The response for donations has been great. Though the pantry has received food to fill their shelves, there are many student requests. With a student’s on-the-go lifestyle, students are requesting food that meet those needs. Foods that are “quick and compact” like granola bars, small microwavable meals, chips, bottled water, and Gatorade are some examples of what is requested most. Coffee is also very popular and is always flying off the shelves. There are many FSCJ students that are also parents, so baby food and formula are also in high demand. The pantry’s staff understand that for students at other campuses, getting to and from the South Campus can be difficult. While other campuses are waiting on their own pantry, students can contact the staff by phone or email, provide a request list, and food will be delivered to that student’s campus. All contact information and summer business hours is listed at the bottom of this article. “I know and understand the need for food and can see the impact it’s had on the students,” said Smith. “I’m super amped about working it!” Even though the pantry’s current staff is motivated, it still has a large need of reliable volunteers. They are currently interviewing students to run the pantry. If you are interested in donating some volunteer hours, please contact the pantry’s manager, Ashlie Barker-Empleo, or the SVC’s, Kayla Smith and Caroline Yazdiya. 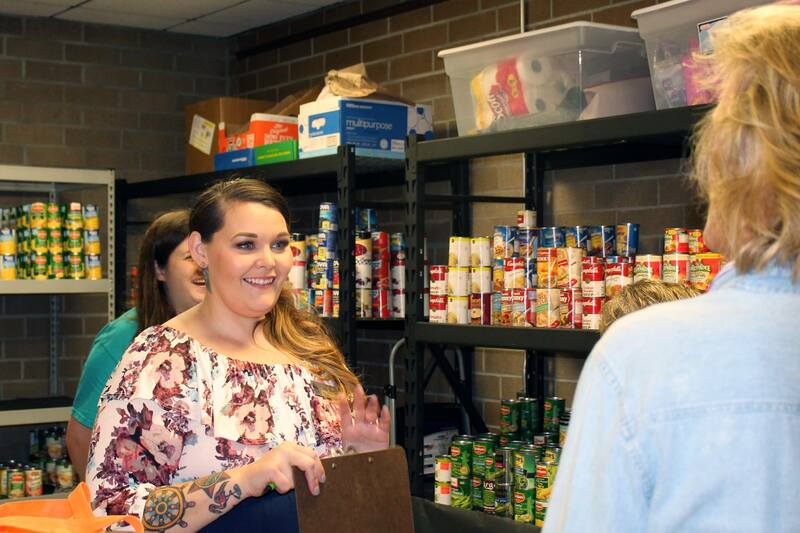 Since its grand opening at South Campus, the need for a food pantry at FSCJ continues to grow. The pantry’s staff is currently planning events for the Fall semester to continue to spread the word of its great mission. You can follow these events on their Facebook page, FSCJ Food Pantry. The H.O.P.E. FSCJ Food Pantry is located in the F-103 room of South Campus. Next Post Impact Jax ft. City Houses Inc.